It’s happened again! Dr. Peter Ciampi has been honored with the designation of Top Dentist in New Jersey Monthly magazine’s 2017 list. This makes the sixth time Dr. Ciampi has been recognized with this prestigious title, and we are so very proud of his achievement. One of the things that makes NJ Monthly’s recognition so rewarding is that dentists are chosen by their own peers in the dental field. The annual selection process begins with the magazine asking dental professionals across New Jersey to vote for the person they believe is a “Top Dentist.” For this year’s list, 6,792 New Jersey dentists were given the survey. Nominated dentists with sufficient votes to pass the first round were then given a place on a preliminary list, and ultimately reviewed for final selection by a professional advisory board composed of 21 dentists. Nominees cannot pay to be included on the Top Dentists list. Year after year, our New Jersey dentist commits himself and the entire team here at Spring Lake Dental Care to provide patients with not only the best treatment, but also the best overall experience possible. 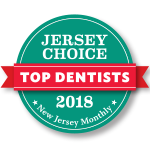 To be recognized yet again as one of New Jersey’s Top Dentists is a very exciting and humbling honor for Dr. Ciampi, and he looks forward to living up to the title long into the future!